pLVX-Puro is an HIV-1-based, lentiviral expression vector. Lentiviral particles derived from the vector allow you to express your gene of interest in virtually any cell type, even primary cells. Expression of your gene is driven by the constitutively active human cytomegalovirus immediate early promoter (PCMV IE), located just upstream of the multiple cloning site (MCS), allowing constitutive, high level expression of your protein of interest. 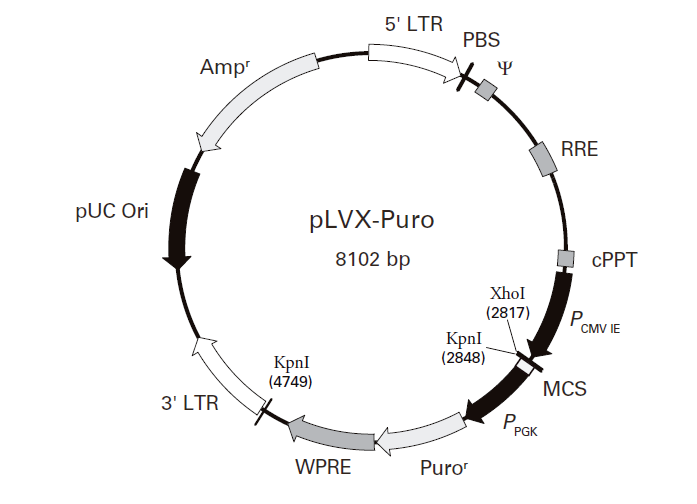 pLVX-Puro contains all of the viral processing elements necessary for the production of replication-incompetent lentivirus, as well as elements to improve viral titer, transgene expression, and overall vector function. The woodchuck hepatitis virus posttranscriptional regulatory element (WPRE) promotes RNA processing events and enhances nuclear export of viral and transgene RNA (1), leading to increased viral titers from packaging cells, and enhanced expression of your gene of interest in target cells. In addition, the vector includes a Rev-response element (RRE), which further increases viral titers by enhancing the transport of unspliced viral RNA out of the nucleus (2). Finally, pLVX-Puro also contains a central polypurine tract (cPPT) element that increases nuclear importation of the viral genome during target cell infection, resulting in improved vector integration and more efficient transduction (3). 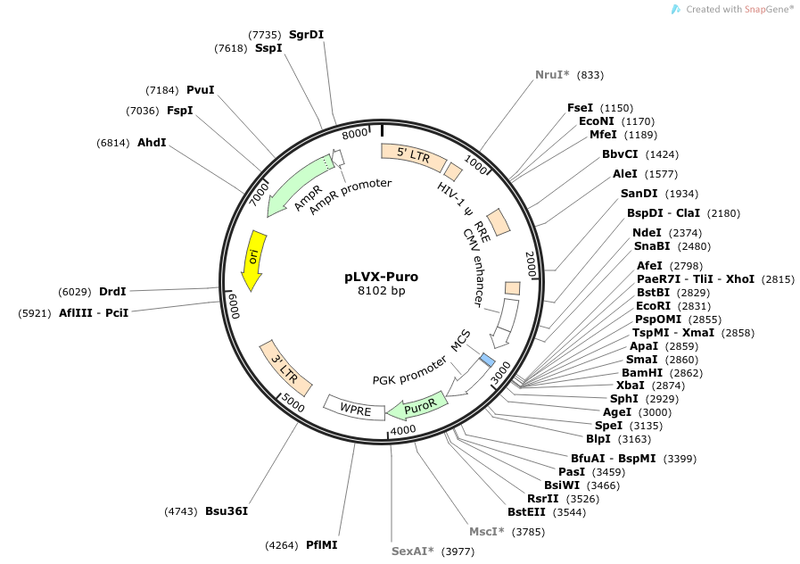 In addition to lentiviral elements, pLVX-Puro contains a puromycin resistance gene (Puror) under the control of the murine phosphoglycerate kinase (PGK) promoter (PPGK) for the selection of stable transductants. The vector also contains a pUC origin of replication and an E. coli ampicillin resistance gene (Ampr) for propagation and selection in bacteria. Lenti-X™ HTX Packaging System (Cat. Nos. 631247 and 631249). This packaging system allows you to safely produce high titer, infectious, replication-incompetent, VSV-G pseudotyped lentiviral particles that can infect a wide range of cell types, including non-dividing and primary cells (4).